We got engaged (officially, despite being living as basically engaged for a while now) on December 15th 2012. We meant to do it on November 17th as the 5th anniversary of when we started dating, but a variety of factors delayed the date and the ring aquisition. On 12/15 I was having a 1.5 hour thyroid scan, and my brother was arriving from San Francisco to visit for a week the next morning, so we were running low on time but we pulled off an awesome evening. (This wasn't a surprise, obviously :) ). Dustin picked me up from my scan with a single big flowering kale flower. He took me home and presented me with our finished ring that had been in production for several weeks. That night we opened a special bottle of wine and had an amazing dinner at The Book Bindery. 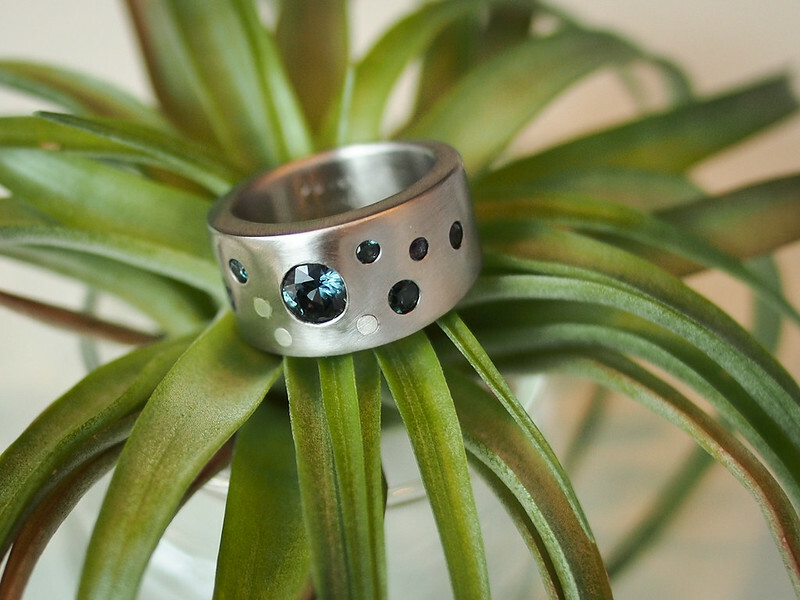 Our ring was custom made, designed by Dustin in collaboration with Sally of Fancy in Seattle. 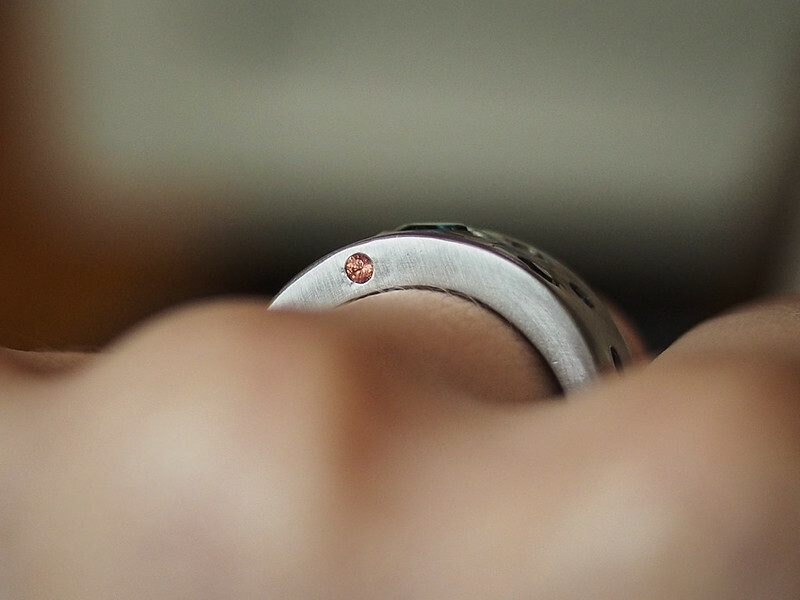 It's a pure palladium band set with eight sapphires and three fine silver dots/rivets. The eighth sapphire is set on the bottom side of the ring and is orange in honor of Mizmo, as a fun way to represent him in our shared life. We originally designed the ring while he was still with us but he passed away during the fabrication, so this stone took on even more meaning. One of the stones on the front is a color-shifting sapphire that looks light green-blue in sunlight but turns a light lavender color in incandescent light - very awesome. 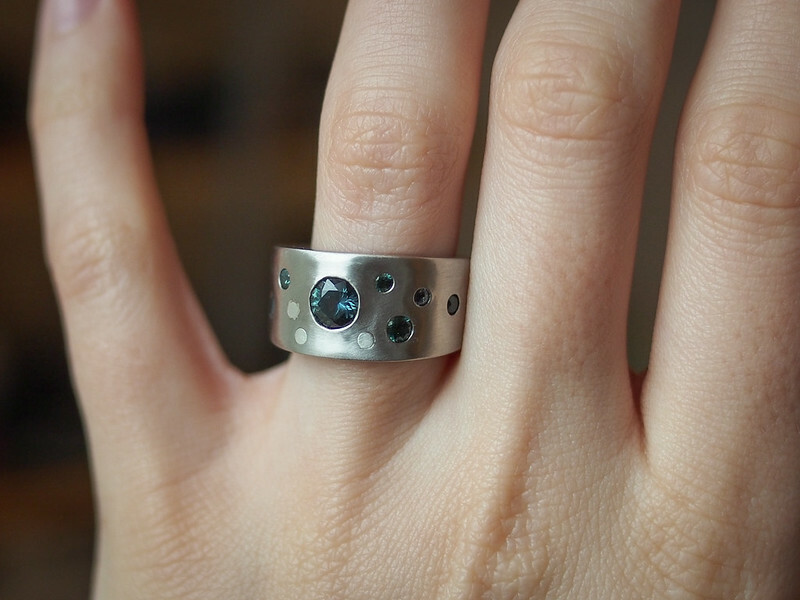 The silver dots are meant to look like moons around the "planet" of the center sapphire. There were a few techinical issues with the ring that needed to be corrected, so after we took the ring back to Illinois and announced the engagement to family, Sally took it back and fixed some things for us. Now it's ready to share on the internet to the wider world! We don't have a wedding date yet but we're working out what we want to do. We're super thrilled to finally be officially engaged and thank everyone for their love and support throughout our relationship so far. Looking forward to the what the future brings!